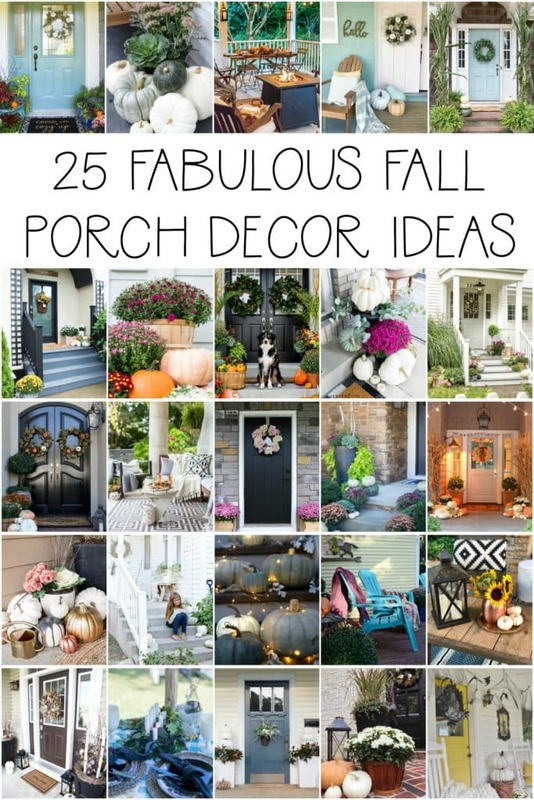 Today I’m excited to be joining a group of 25 bloggers, hosted by my friend Krista from, The Happy Housie, and we’re all sharing our porches dressed up for fall! A few weeks back, I shared some fall planter inspiration, and today I’m sharing our completed fall porch and planters for this year! I’m pretty sure this is the most elaborate I’ve ever decorated our front porch for fall (or any season really). But overall, it’s still fairly simple. 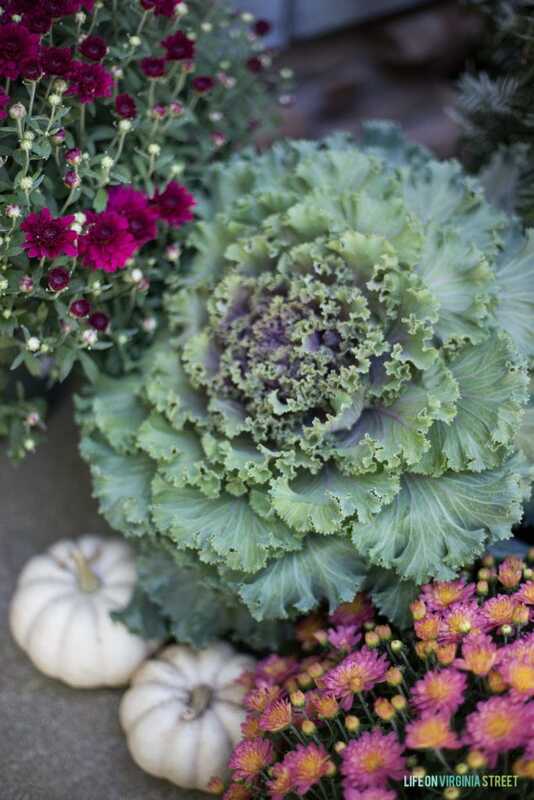 I used a repeating mix of mums, kale and white and green pumpkins! I love how it turned out, and it only took me about 30 minutes to set up! My mums still aren’t fully blooming yet, so I think it will all look even more beautiful in another week or two when the color really shows up! In the past, I always thought our porch stair were too narrow to decorate. But, there’s more room left than I thought there would be and it’s fun to use the different levels! The potato vines in my planter were still doing really well here (likely because it’s so sheltered) so I opted to keep them for fall. Or at least until they don’t look great. I also added some birch limbs, ornamental grass, mums, cabbage, and pansises to the planter. You can find our porch lanterns here. 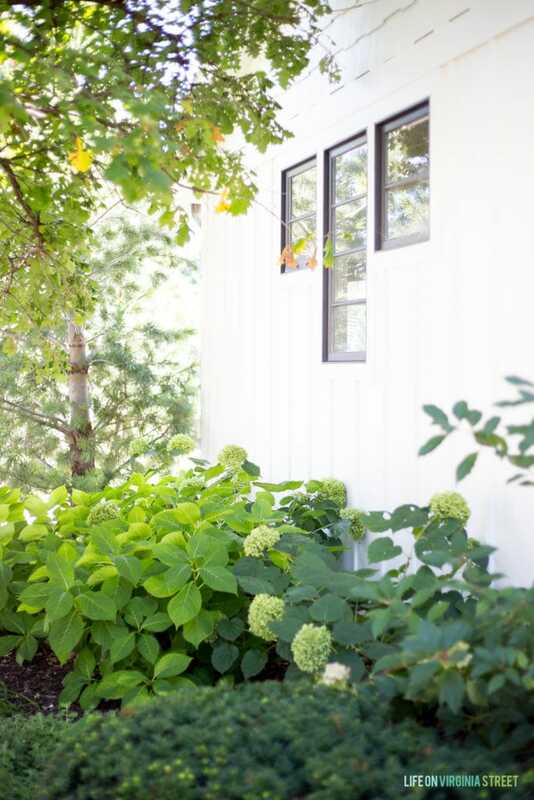 I love how the white pumpkins look against our freshly painted white exterior! I forgot to get a great shot of our door mats (oops!). 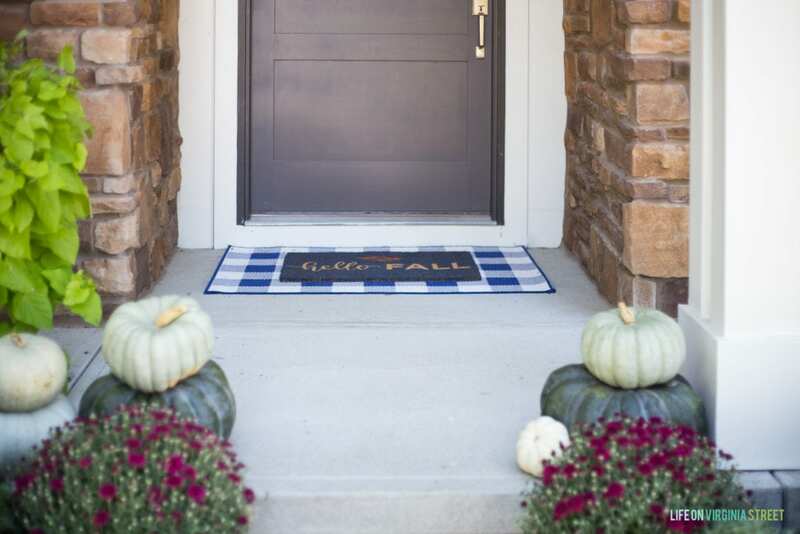 But I layered my favorite blue and white buffalo check mat with this Hello Fall mat. I’m loving the combination of this texture and color! 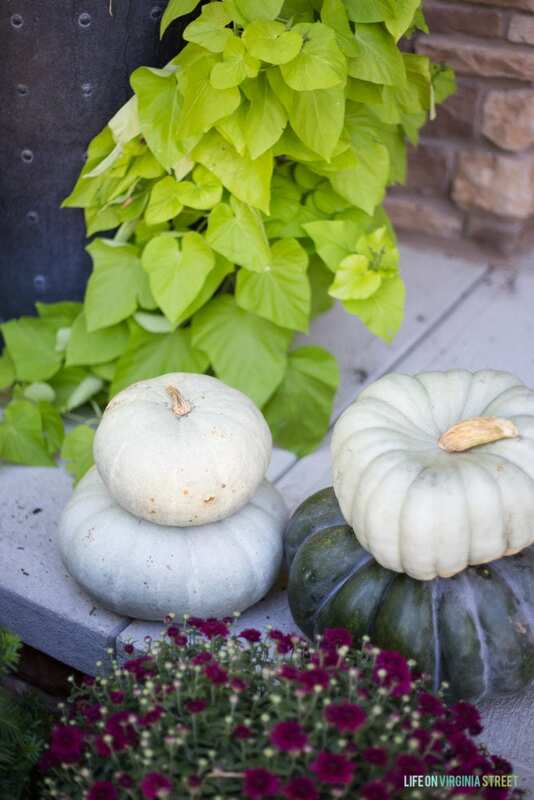 Shades of green and white pumpkins may officially be my new favorite thing! I found these beauties at Trader Joe’s. And while I was out shooting, the fall light was so beautiful on the side by our garage that I had to share this image. My Annabelle hydrangeas still have their blooms I love how this area was glowing in the fall light! I hope you enjoyed our mini fall porch tour! 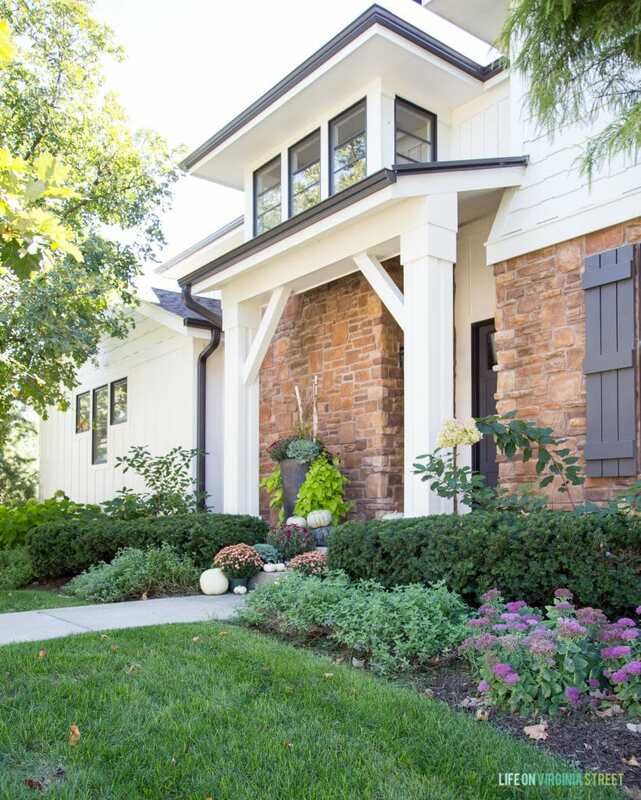 Now, there are 24 additional gorgeous fall porches to tour that are full of fall porch inspiration! All links are included below. It looks beautiful and all ready for fall, Sarah! Just the perfect way to welcome guests to your home! It looks so pretty and festive without being over the top. Love it! Gorgeous, Sarah! I love your grand entry pot and double mats. 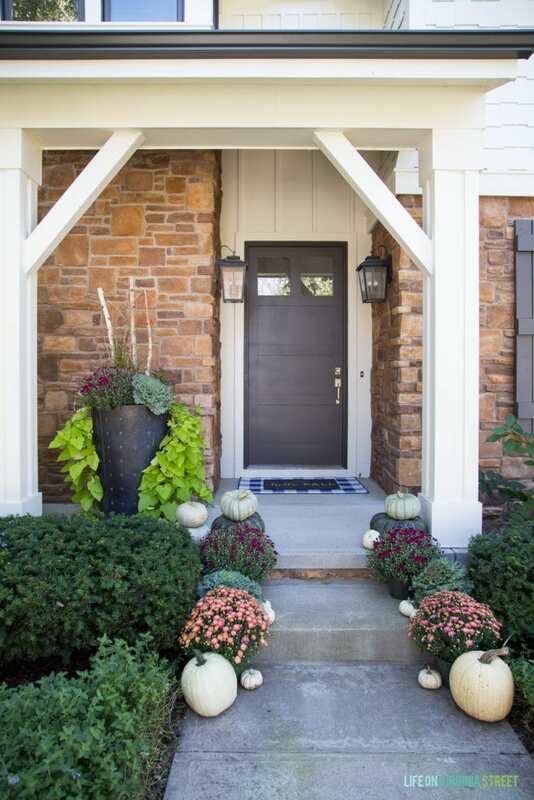 Such a pretty and welcoming fall entry:) Glad you could be part of this hop! Such a beautiful entry, Sarah! Perfect for fall! Hope you’re having a great week, friend! happy fall to you my friend! 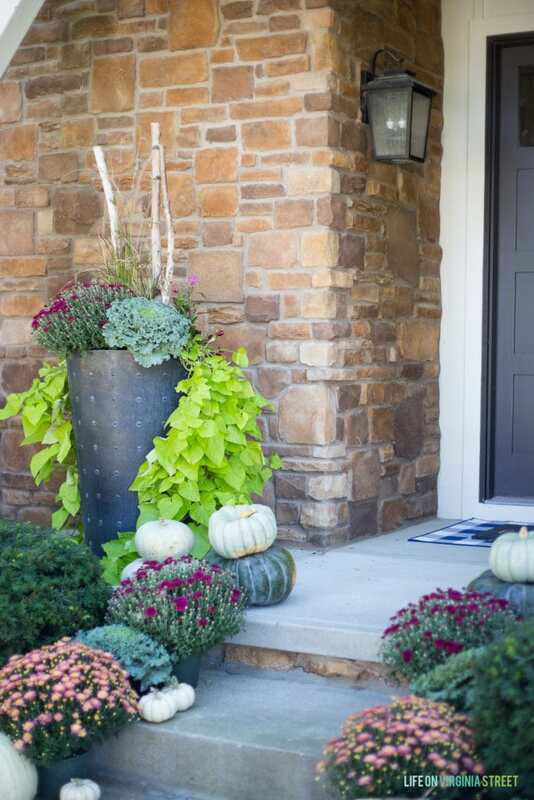 There’s nothing more beautiful and inspiring than mums and pumpkins for fall! Your porch is so pretty!